Solar heating for backyard pools is a trustworthy technology. Water from your swimming pool, after flowing through your pump and filter, is transferred to solar panels and then returned to the swimming pool. Using the Sun’s energy heats your swimming pool without the expense of a gas heater and increases your swimming season by months! It’s easy and it works. Sunlight gives the energy to warm the pool so you may enjoy swimming from Spring to Fall, earlier in the morning, and later in the evening! Too many people pay for the maintenance of a swimming pool and get very little use out of it, simply because they’re unhappy with the temperature. Solar pool heating allows you to take full advantage of a long swim season and perfect water temperatures! For additional information about how to have pool climate control with a Heliocol solar pool heating system, call Solaron in Placerville at 916-631-9293. 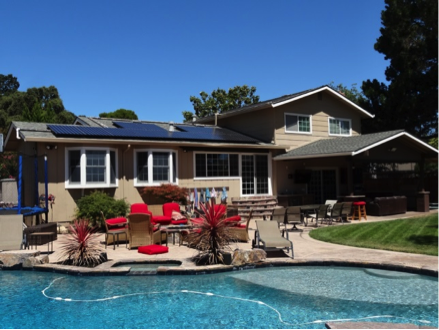 Our technicians come to the household, consider the landscape and the pool and offer a complimentary evaluation for a solar pool heater installation. Trust Solaron for leading products in solar pool climate control! Solaron – using energy for life!